Oil change reminder stickers are a valuable client retention tool for auto dealers and auto body shops. AutoShop Express offers a variety of custom oil change stickers to meet your service center’s specific needs. 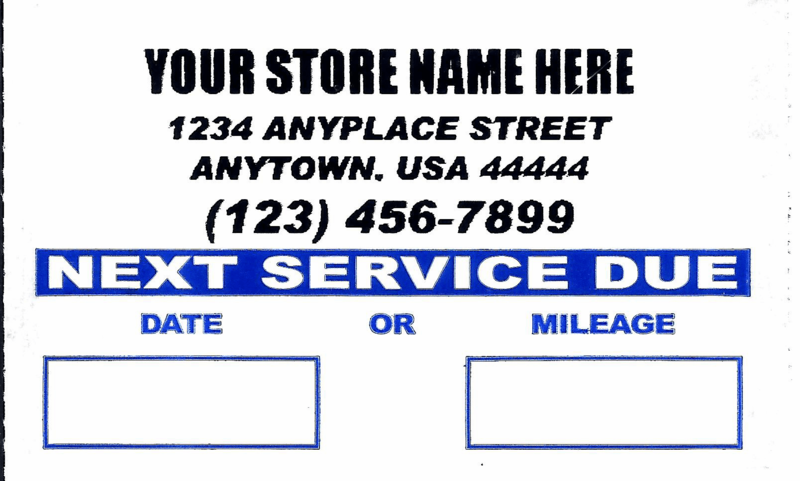 Available in rolls of 500 or 1,000, our service reminder stickers can be customized with your shop's name or logo, along with your phone number. Customization is a great way to differentiate your shop from others by incorporating your company logo or even the ASE logo (if you have ASE-certified staff) into the sticker – certification does factor into some car owners’ selection process. Our clear static vinyl stickers have a very low tac backing, ensuring secure adhesion and easy removal. And as with all our auto dealer service products, we ensure accurate order fulfillment and quick delivery. Pricing discounts and free shipping (within the U.S.) are available for bulk orders. Select an option below to order your oil change reminder stickers today.